Boone is a small town in the Blue Ridge Mountains, the county seat of Watauga County, and home to Appalachian State University (Appalachian). Appalachian enrolls 18,000 students, but only 5,000 students reside on campus. The remaining students drive, bike, walk, or take transit to commute to the university. There has been a higher number of pedestrian crashes in recent years, particularly among the student population. The Watch for Me NC program in Boone aims to decrease the number of pedestrian collisions for both the general and student population. In addition, Watch for Me NC has focused on improving the safety of intersection and midblock crossings, as 43 percent of pedestrian crashes in recent years occurred at crossings. The Watch for Me NC lead agency, the Boone Public Works Department, and the Planning and Inspections Department have developed several important partnerships for implementing education and enforcement activities within the town. 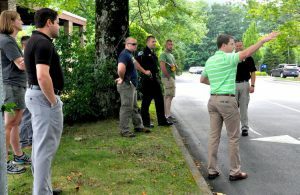 The agency collaborated with the health department, Appalachian, the Boone Police Department, the Watauga County Board of Education, and local transit agency, AppalCart. Additional support came from the local bike club, the Boone Area Cyclists. In 2016, the number of partnerships grew to include Active Routes to School Region 3, Appalachian’s Recreation Coordinator, High County Recreation, Safe Kids Watauga County, and Watauga Medics. Since 2014, Hardin Park School’s Walk to School Day has provided the backdrop for the Watch for Me NC’s Campaign Kick Off. The annual Bike Rodeo is also held at the school. Local officials noted, “It’s all about the early education, because, really, what we’re changing is the culture.” Watch for Me NC has been present at the Appalachian safety fest on the university’s campus, and a collaboration with the League of American Bicyclists featured a Watch for Me NC presentation followed by a group ride. Beyond the school events, Watch for Me NC campaign bilingual material in English and Spanish has been distributed at the town’s Halloween Festival, Downtown Boo, and to downtown merchants for store display year-round. In the spring, the Watch for Me NC message is distributed around local screenings of the Banff Mountain Film Festival. Police officers have adopted the habit of talking to the public about the rules of the road as they pertain to cyclist and pedestrian safety. Through these efforts, officials feel that the community is becoming more aware of the safety issues. Operations have been complemented by public service announcements and sandwich board signage to increase awareness of safety rules and regulations. Enforcement operations at Appalachian led to the distribution of over 200 brochures and contact with over 250 road users. Watch for Me NC activities generated significant support from the Boone community and elected officials. In the second year, the town reported increased awareness of the campaign, highlighting the importance of a sustained commitment to the program’s goals. In anticipation of 2016 Walk to School Day at Hardin Park School, Boone staff completed a sidewalk around the school, connecting it to the town and housing developments. Boone is also looking into installing a sidewalk along a major roadway, Route 194, through the town. The Watch for Me NC outreach materials in Boone were published in both English and Spanish and considered the town’s cultural diversity. Site selection was given careful consideration—enforcement locations were based on density and level of pedestrian traffic. This allowed for the most efficient use of resources and reached the greatest number of people possible in a short period of time. Boone also initiated relationships with schools to partner early in the process. This not only helped identify potential challenges, but also provided the location for outreach activities. Thank you to Eric Gustaveson, Deputy Public Works Director with Boone Public Works, and Jane Shook, Development Coordinator with the Boone Planning Department, for providing leadership, time, and expertise that contributed to the Watch for Me NC Campaign in Boone and the information in this profile.